Every year our English teacher solicits our favorite poems for National Poetry Month and requests that we give her a picture of ourselves so that her class can make posters of our poems to hang in the hallway. Last year I made myself look like Iowa artist Grant Wood. This year I decided to make myself into H.L. 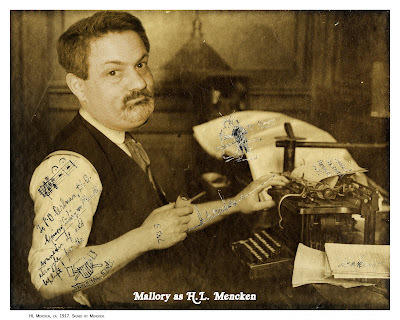 Mencken, political columnist, humorist, social commentator, reporter, and editor of the Baltimore Sun, back at the time of Theodore Roosevelt. I may never be as famous or influential a writer, I may not even have a weekly column in our tiny local paper anymore but I still love writing. Maybe someday God will even let me make a living at it. Please note that the beer mug tattoo was drawn on the original photo by Mencken himself- that's not something I added on my own.